Cleaning graffiti from the exterior of buildings, walls, pavements and from the inside of public areas, stations, tunnels, schools and much more costs millions of pounds every year. It’s unlikely that graffiti will stop any time soon, but Rawlins Paints can help prevent any damage with our range of anti-graffiti coatings, paints and products. Anti-graffiti coatings are preventative paints that work to stop inks, aerosols and other markings bonding to the surface. Sometimes referred to as anti-vandal paints, these anti-graffiti products can be used internally and externally on a wide range of different surfaces, including previously painted surfaces, bare surfaces, smooth surfaces like metal and plastic, porous surfaces like brick and stonework. Nu-Guard AG is a unique, one coat anti-graffiti coating that protects all surfaces, including brick, concrete, render, stone, wood and plastic against all types of graffiti and poster glues. It’s been completely re-engineered in England to provide the most vandal resistant finish ever achieved anywhere in the world. Nu-Guard WB Concrete Sealer is a modified Vinyl Acetate, non-flammable and non-toxic sealer. It is formulated primarily for use on concrete and brickwork. 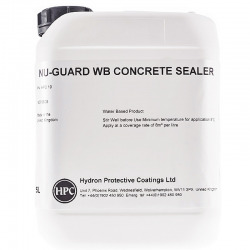 Nu-Guard WB Concrete Sealer primes/seals very porous surfaces and prevents the darkening of light substrates prior to the application of Nu-Guard AG Clear and Coloured Finishes. 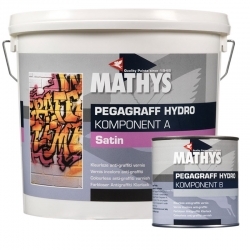 Mathys Pegagraff Hydro is a clear coating designed to protect a range of bare and previously painted surfaces inside and out from graffiti attack. Can be used on floors, walls and other surfaces to create a tough, clear glaze that can be easily and frequently cleaned to remove any unwanted graffiti that may occur. We know the finish is just as important as the anti-graffiti properties of the paint, coating or lacquer, so we have various primers that will prevent the surface from ending up darker or having a ‘wet look’ after painting. 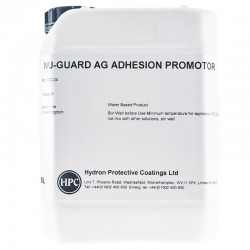 We also stock adhesion primers for tricky surfaces and nano-technology coatings for when you only want to apply a very thin film of coating. Our anti-graffiti products complement our range of anti-climb and anti-vandal products, which all work together to protect and maintain the surface of any building, wall, floor or any other substrate that needs protecting. We carry various anti-graffiti primers and sealers, including our transparent sealer for porous surfaces, such as brick walls. It should be used before you apply our Clear Graffiti Coating to make sure the finish won’t be dark or wet-looking. The system will ensure that the appearance of the surface isn’t altered when you’ve completed the project. For smooth, dense materials, such as metals and powder-coated surfaces, we recommend our Clear Adhesion Primer. Use this before applying our Clear Graffiti Coating and its light corrosion-inhibiting properties will make sure the coatings bond together to do their job well. 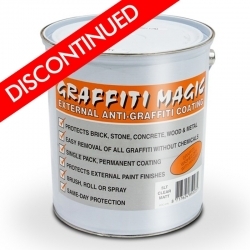 Use as a spray anti-graffiti primer or stick with a brush or if you prefer for a rust-free, graffiti free surface. It can be applied to galvanised steel, tiles and glass as well. 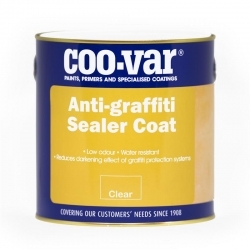 Coo-Var Anti-Graffiti Sealer Coat is a clear sealer for porous surfaces, designed to be used in conjunction with Coo-Var Graffiti & Flyposting Protection Paint, which is a technologically advanced clear coating that gives long term protection against damage caused by graffiti and posters. Anti-graffiti coatings can be used on exterior surfaces that are vulnerable to the threat of vandalism, including concrete walls, render, timber, metal cladding and most previously painted surfaces. They a guaranteed to make the surfaces easy to clean and with amazing longevity. 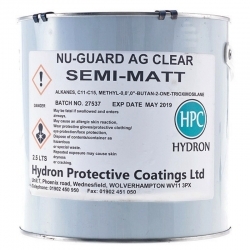 In the same category, we also stock Mathys Pegagraff Hydro, which can be used to protect a range of bare or previously painted substrates. The clear anti-graffiti glaze can be used on floors, walls and any other surface that may be under attack from graffiti, and can be easily cleaned afterwards. 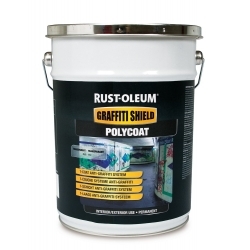 Rust-Oleum GraffitiShield Hydro works well on natural stone, all porous mineral surfaces, brickwork and concrete. Waterproof and UV resistance, it is virtually invisible and gives a permanent anti-graffiti coating that can stand up to repeated cleaning. As it’s so resistant to solvents and chemicals it will stay intact even after graffiti has been cleaned off. We recommend using Rust-Oleum GraffitiShield Cleaner with Hydro. We also stock the perfect tool to apply Rust-Oleum GraffitiShield Hydro and Rust-Oleum GraffitiSheld Wax – the GraffitiShield Spray Pump. Also by Rust-Oleum, the spray pump allows you to apply the anti-graffiti spray paint quickly and cleanly, with minimal wastage. Blackfriar Professional Anti-Graffiti Lacquer is a clear anti-graffiti coating for external surfaces and can be used on wood, brick, concrete and stone. Once applied, it will allow for easy removal of graffiti, whether it’s permanent marker, conventional paint or aerosol. 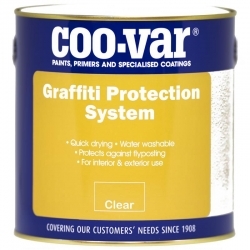 We stock Coo-Var’s specific Anti-Graffiti Kit, which contains everything you need to protect surfaces from graffiti. 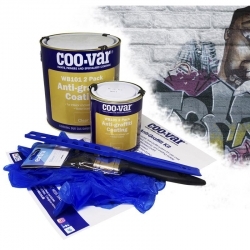 An easy to use kit with full instructions on how to prepare, mix and apply the coating to provide a long lasting graffiti-protective finish. Ideal for small projects inside or outside, it will cover an area of 14-18 square metres with one coat and cuts out all the hassle of searching for individual products.